United could finally clinch the transfer of the Lille defender this week but still need to raise their bid to convince the French outfit to part with one of the stars of Euro 2012. The Journal understands that is likely to happen this week, when Newcastle return from their Portuguese training camp. Their cause is certainly helped by Debuchy having made up his mind to join Cabaye at St James’ Park – something that the France midfielder has now confirmed beyond all doubt. Speaking to The Journal after Newcastle clinched the 12th Guadiana Trophy by defeating SC Braga, Cabaye said that he is in constant contact with Debuchy, who is simply waiting for a fee to be agreed to move to England. “Mathieu has made a very difficult to decision to leave Lille but he has made the decision. Now I hope Newcastle push for Mathieu and I want them to do the deal,” he said. “I spoke with him two days ago and he told me he wants to come. I hope Derek (Llambias) and Mike Ashley will do the business now. which will give Newcastle more of an idea about the composition of their squad for next year. They will not conduct major surgery on the squad but the addition of Debuchy has long been mooted by the powers-that-be at St James’ Park and the player has already agreed terms with Newcastle. Before any business is done, United have been given a couple of days off after their exertions out in Portugal. Newcastle became the first English club to win the Guadiana Trophy but the unwieldy bauble they will bring back to the North East is less important than a goal-scoring return for Steven Taylor and the encouraging performances of Sylvain Marveaux, Sammy Ameobi and Gaël Bigirimana in games against teams of the same standard that United will meet in the Europa League. Indeed, Alan Pardew was delighted with the way the team performed against Braga and Olympiacos and has granted them rest days before they jet out to Holland to take on Tim Krul’s former club Den Haag on Saturday. Midfielder Cabaye (pictured right) looks certain to start that game as Pardew looks to have one of his key men back to his very best in time for the opening game of the season against Tottenham. The France schemer admits he was a bit ring-rusty at first against Braga but says he enjoyed his return. Cabaye nearly scored in the final minutes against the Champions-League bound Portuguese side but his shot was well saved by goalkeeper Beto. 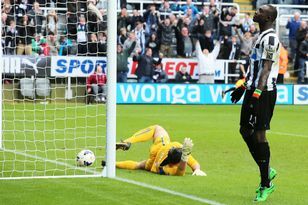 “It is very nice to be back with Newcastle. I have had four weeks of holidays but now I am glad to be back,” he said. “I am delighted to be back to build my fitness for the start of the Premier League season because it is going to be an exciting season for us. “It was tough against Braga for the first five minutes because it is a long time to be away but after that it felt good and I felt like I was ready. BY Christmas, we will know whether Newcastle United’s breakthrough season was laying the foundations for something more lasting or simply a case of the club banging its head against the glass ceiling.